I visited Created Hardwood’s Columbus Showroom and was blown away! 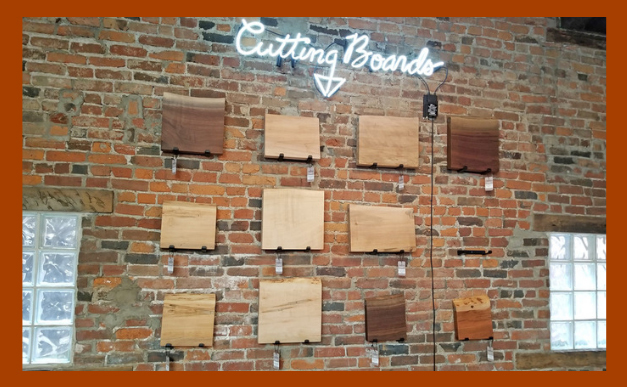 Ever since Created Hardwood Ltd. – Butcher Block Co.’s supplier of Live-Edge Wood Slabs – opened a showroom in their hometown of Columbus I have been wanting to check it out. Recently I visited Ohio’s capital city and thoroughly enjoyed my tour of CH’s extraordinary exhibit. 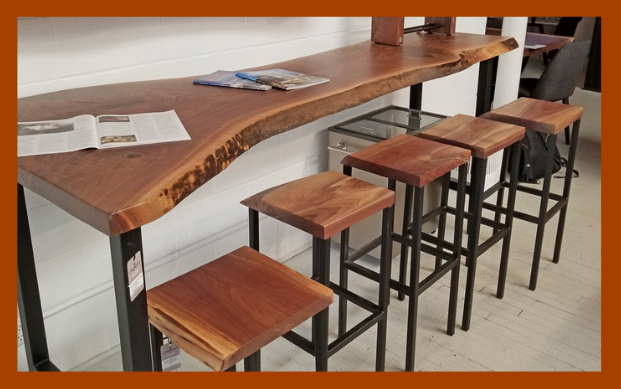 Created Hardwood’s live-edge wood slabs are used to make stunning, natural countertops and one-of-a-kind tables for kitchens, dining rooms, lobbies and conference rooms. I learned that the family-owned firm has discovered a myriad of other clever uses for the slabs they salvage from downed trees. Upon entering the showroom you cannot help but be overwhelmed by the striking beauty and variety of options before you. The main hall of the exhibit showcases a selection of live or rustic-edge slabs mounted on a number of different metal bases. All told, CH offers 11 different table base styles and its design experts are eager to help customers find just the right base for the slab selected. Here are a couple of extra-large slabs that would undoubtedly transform a dining room or a conference room. Narrower slabs can be transformed into gorgeous library tables, desks and countertops. Smaller recycled slabs can make perfect accent or coffee tables. Notice how much impact the selection of table legs can have. The wood slab in the photo is mounted on “Points” legs, which provide a delicate look suitable for a coffee table. While a similarly sized slab is mounted on heftier “Taper Up” supports, which signal this is a sturdy bench. …as was this island bar and bar stools set. In the rear of the store a neon sign calls (more like “shouts”) one’s attention to CH’s wood slab cutting boards exhibit. Rectangular slabs of various species and sizes hang, much like paintings in a gallery. They’re mounted on an authentic red brick wall, providing keen contrast in color, material and texture. 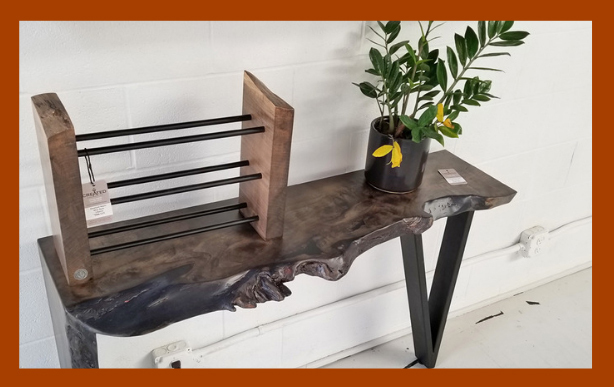 By this point in my tour I was so impressed by the variety of CH’s creative re-use of salvaged, living edge natural wood slabs that I couldn’t imagine what I’d find around the next corner, nor could I wait to see. And sure enough, I wasn’t disappointed. I discovered a mock bedroom showcasing a wood-slab headboard, and an adjoining bath with a mirror framed at its top and bottom with wood slabs with live edges. And as they say on infomercials, “Wait, there’s more.” That’s when I discovered that the seat and back of a cushion-covered loveseat in the main exhibit hall were also wood slabs. But to be honest, by then I should not have been the least bit surprised. Here’s one of CH’s more interesting designs. It marries a glass table top with table base consisting of interlocking wood slabs. If you live in or near Columbus or ever visit, be sure to check out Created Hardwood Ltd.’s unbelievable tribute to wood slab recycling. It’s located downtown, at 16 West Poplar Avenue. If you want to shop online, visit us at butcherblockco.com and see our selection of Created Hardwood live-edge slabs, table bases and cutting boards. Warm thanks to my tour guide, Created Hardwood’s National Sales Manager, Max Charney.